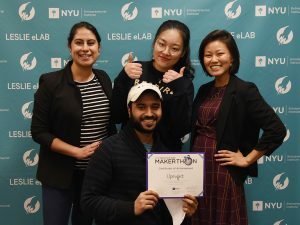 The 4th annual NYU Healthcare Makerthon (Oct 26 to 28th, 2018) brought together NYU students, faculty, and staff in an effort to solve some of healthcare’s most pressing challenges. Over the course of the weekend, individuals from across 18 NYU schools and colleges joined forces at the Leslie eLab to learn, network, brainstorm, and prototype. 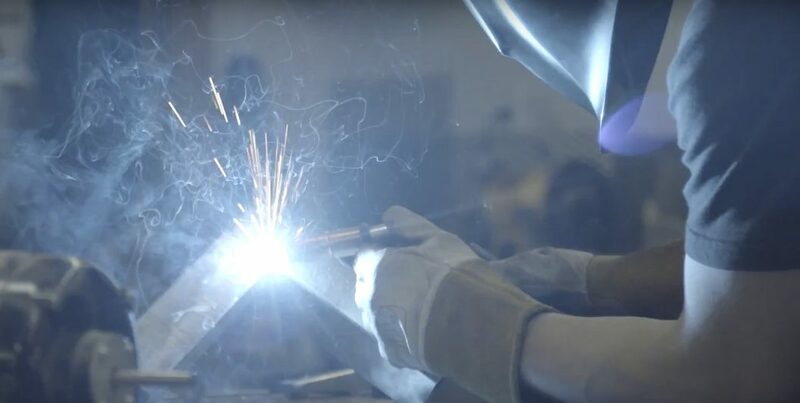 Forty hours, and about 300 cups of coffee later, 15 teams took the stage to compete for $5,000 in funding and a chance to move onto the final stage of the Makerthon. 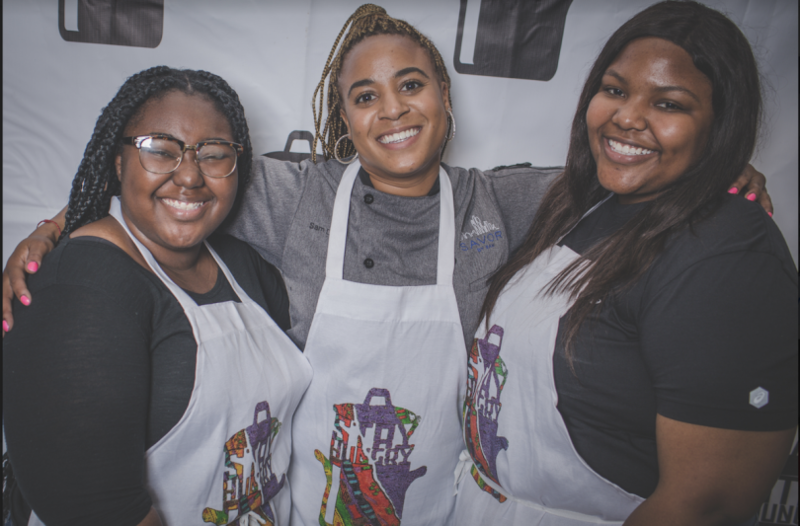 What fueled them throughout the weekend wasn’t just the chance to win prize money, or even the caffeine, it was the opportunity to learn a community-centered approach to innovation, while tackling meaningful challenges in healthcare. Design solutions that promote social connectedness: How might we use technology to empower older adults to stay connected to families, friends and their surrounding community? Reimagine solutions that promote fitness and mobility: How might we empower older adults to live better through mobility and fitness? Create tech that empowers independence and safe living: How might we transform the home environment to enhance self-reliance and enable the ability to stay at home later in life? Friday night kicked off with NYU alumni and serial entrepreneur Jeff Dachis (Steinhardt ‘92), founder of One Drop, sharing his experiences in identifying problems and opportunities for people managing diabetes. 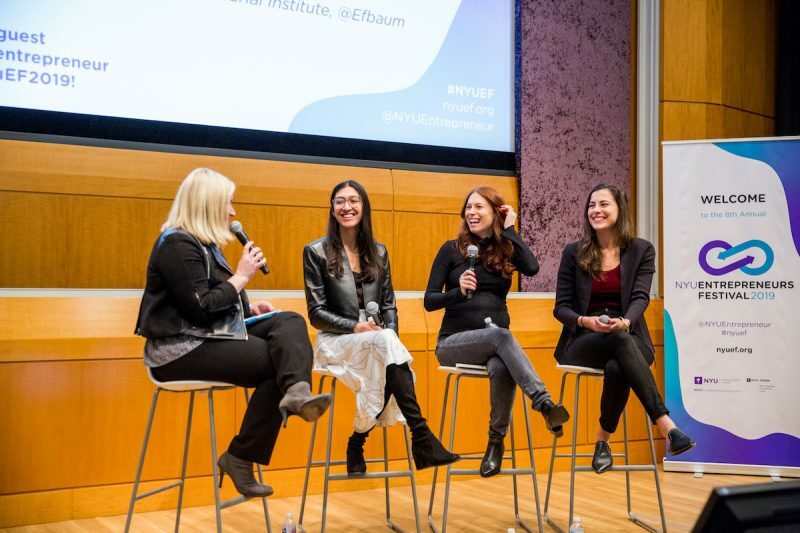 Student startup founders Darya Moldavskaya, founder of ReverCare, and Sabina Braverman (Wagner’ 18), founder of HealthHuddle and winner of the 2017 Healthcare Makerthon, then shared their startup journeys and some words of wisdom to the participants. On Saturday, each participant developed a depth of understanding towards each challenge by engaging with aging adults and caregivers and thirty-five expert mentors. This unique community-centered approach to problem solving is a hallmark of the Makerthon, allowing participants to draw upon each other’s optimism, expertise, and diverse points of view. Participants were joined by 15 seniors and caregivers from Neighbor2Neighbor, a community of seniors focused on helping each other to age in place around Washington Square Park, and from RenewalCare, an organization which provides care to older adults and people living with chronic health conditions. Next, it was time for them to flex their creative muscles by ideating solutions to their chosen challenges. 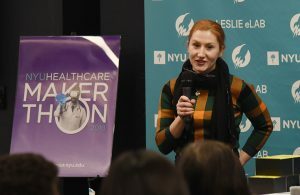 The Makerthon brought in over thirty-five clinical, design, investor and entrepreneur mentors who, alongside the mentors on the NYU Entrepreneurial Institute team, provided guidance and real world insights to teams. In addition to mentor support, throughout the day, guest speakers from the Design Lab at NYU Tandon Makerspace, the NYU Ability Project, and NYU Rory Meyers College of Nursing each gave lightning talks on ethnographic research, human centered design, and gerontology to aid teams in the process of research and ideation. Finally, students were offered perks from Twilio, InVision, Balsamiq and VivaLnk to help them prototype their solutions. By the end of the weekend, the teams fully formed their venture concepts and pitched a panel of judges representing experts in aging, medicine, and design. The panel of judges consisted of Allison Becker from Aging 2.0, Dr. Paresh Shah from NYU Langone Health, and Allan Chochinov, from Core77 and the School of Visual Arts. Following the weekend, the four winning teams will receive 1:1 coaching from the Entrepreneurial Institute, as well as grants to develop prototypes and continue customer discovery. Each team will work to validate and realize the concepts formed over the weekend, and will have an opportunity to compete for the grand prize on November 29th. All 15 teams are invited to submit their innovation concept to the NYU Aging Incubator Innovation Challenge for an opportunity to win $10,000 of non dilutive funding. 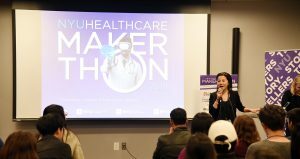 The 2018 Healthcare Makerthon is led by a partnership between the NYU Entrepreneurial Institute, NYU Langone Health, and NYU Aging Incubator, with support from the NYU Office of the President. Financial support is provided by Masimo, the NYU Aging Incubator, and VentureWell, with additional sponsorship from VivaLNK, the Blackstone Charitable Foundation, InVision, Twilio, Balsamiq, Trader Joe’s, Fairway, and the NYU Production Lab. Additional thanks to members of the Makerthon steering committee from NYU Tandon School of Engineering, NYU Faculty of Arts & Science, NYU College of Global Public Health, NYU Steinhardt, NYU Rory Meyers College of Nursing, NYU Langone Health, the NYU Aging Incubator and the NYU Entrepreneurial Institute team. Neighbor2Neighbor is an all-volunteer organization based in the central section of Greenwich Village with University Place as our geographical anchor. We are concerned with helping each other remain at home as we age: a concept called “aging-in-place”. We support social groups, an inter-generational volunteer network, and we act as advocates for seniors in our community. Renewal Care mission is to bring renewed well-being and freedom to people giving and receiving long-term care. We provide holistic, person-centered care to older adults and people living with chronic health conditions. Advancing beyond the goals of clinical care, we help our clients lead lives rich in connection, purpose, and meaning.